Safety first! SERVPRO of Athens trains their employees to always think safe. Peter Wood, owner, conducts meetings with the production crew to update safety policies and procedures. Our technicians are trained to always think of safety first. SERVPRO of Athens offers various carpet cleaning techniques. Pictured was a room that was cleaned using the Showcase method. 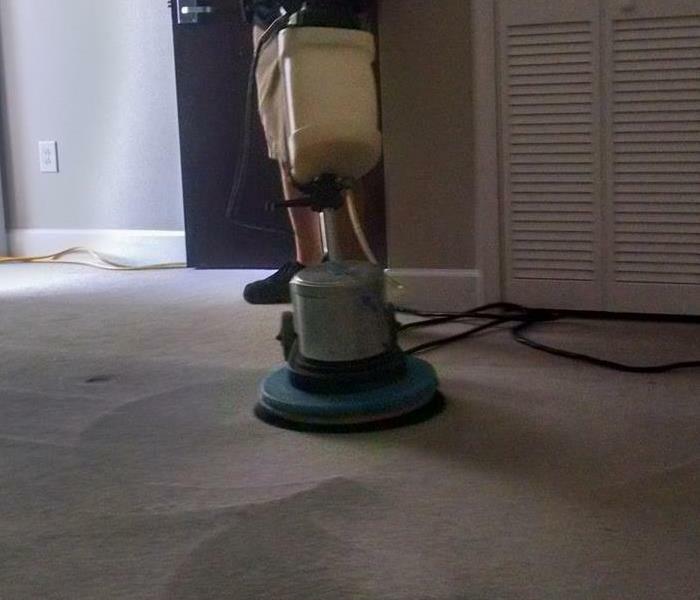 This method uses a rotary machine to shampoo the carpet. The carpet is then rinsed and steam extracted. After the carpet is cleaned our technician will pilate the carpet. The final result is beautiful clean carpet! Our professionals worked day and night out of state to assist those in need during the hurricane season. Pictured you can see Matt and Sergio cleaning up after demolition due to flooding. We appreciate our production technicians and all that they do to help those who have experienced a disaster such as this. SERVPRO of Athens is all about getting a job done! Our technicians are trained to think of safety first. Pictured are two technicians strapping up with safety harnesses for a very high ceiling cleaning. Our professionals are proud to show off their safety awareness! Pictured is one of our Production Technicians, Lee Olcott, moving contents. He assisted a family to move in to their home after a fire damage. The family was excited to have their belongings back cleaned and ready to move in. Jared is one of SERVPRO of Athens technicians. He has been with SERVPRO of Athens for about 15 years. Jared enjoys assisting with water damages, duct cleanings, and general cleanings. He has a lot of experience and enjoys helping others. David Chance is one of our many superstars here at SERVPRO of Athens. This is a rare photo of him in his office. David is rarely in his office as he spends a lot of time out in the field building relationships and helping in the community. Happy Holidays from SERVPRO of Athens! Every year Claudia helps to decorate our Christmas tree. This year she had the assistance of Josie Hanson one of our many Production Technicians. Come visit us to see our beautiful tree! Pictured is the home of an Athens, Georgia resident. 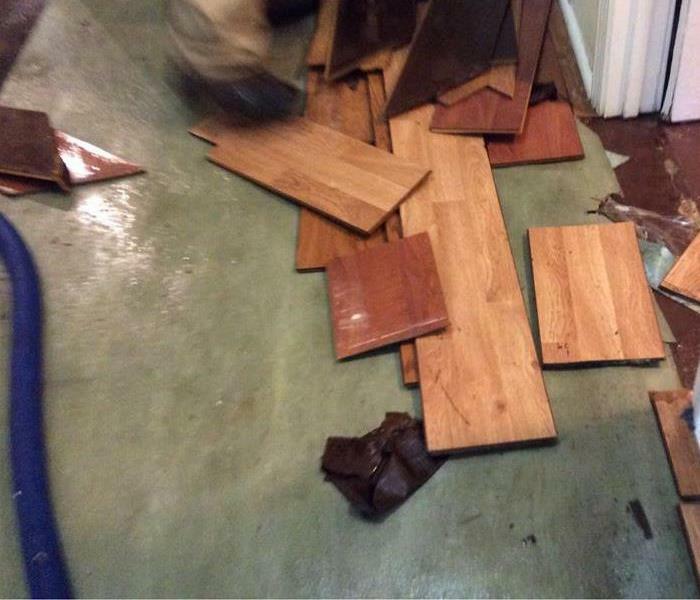 The wood flooring in her home was unable to be dried in place, so demolition of the flooring was performed. SERVPRO of Athens removed the flooring and set drying equipment to dry the structure properly so as to prevent mold from spreading. 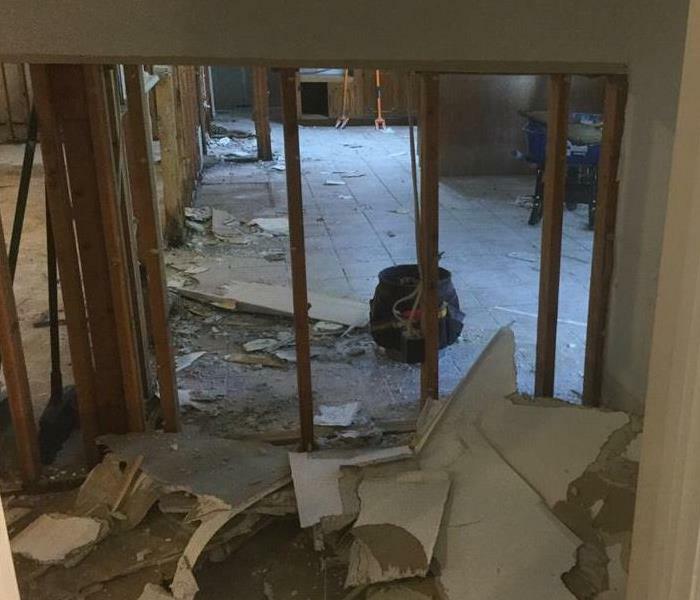 Demolition may be necessary in extreme water damage cases. Pictured is a flood cut performed due to rising water. 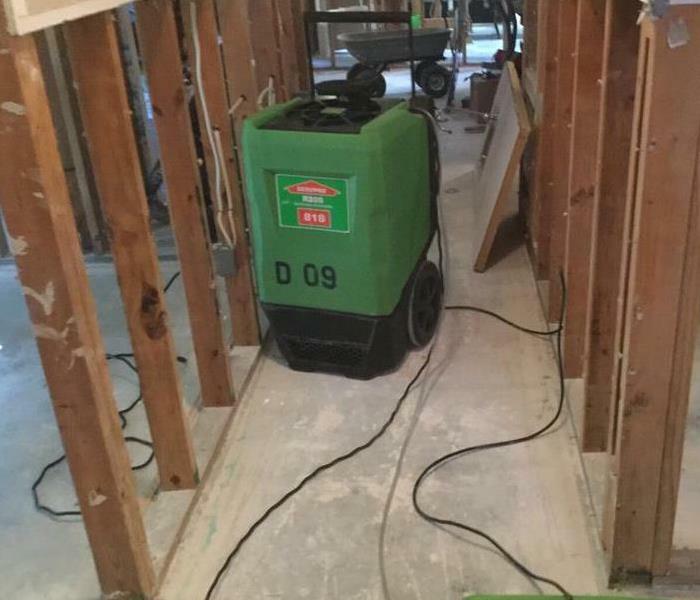 SERVPRO of Athens performs demolition then cleans and hauls off debris in order to further the drying process. During heavy rains and storms flooding occurs. When the water rises to a certain depth within a structure it may be necessary to perform a flood cut. Here you can see where we assisted a resident that had an enormous amount of rising water. 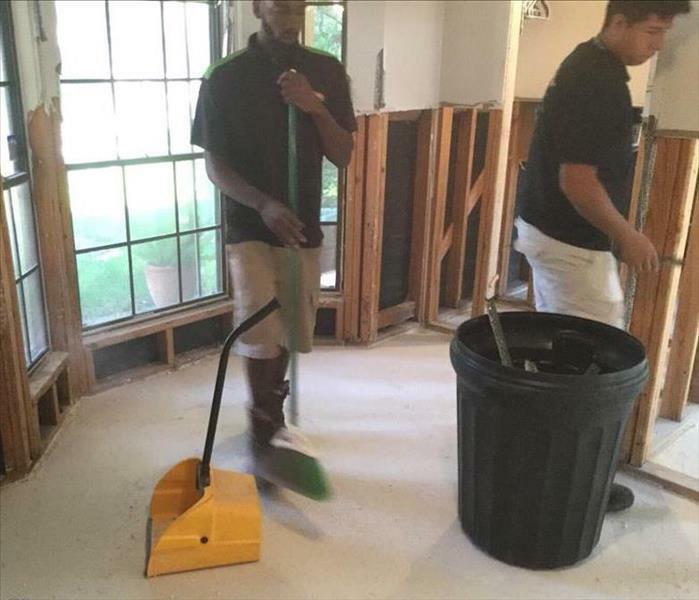 SERPVRO of Athens performed a flood cut and cleaned the debris and removed it from the home. We then set drying equipment to further dry the structure. This home was left unattended and had a water damage occur in the basement. SERVPRO of Athens completed demolition and mold treatment and removal following the IICRC guidelines and protocol. SERVPRO of Athens also used specialty equipment to dry the structure and further prevent mold from reoccurring. Recently Athens, Georgia has been experiencing an abundance of floods due to rainwater. Rising water is not clean water and can bring many contaminants into your home. Mold spores are often left behind and travel throughout your structure rapidly. It is imperative that you dry your structure properly in order to reduce the risk of mold growth. Rising water has become an issue as of late to our Athens, Georgia residents. Water damage left unattended can cause major structural damage including mold to grow and spread throughout your home. 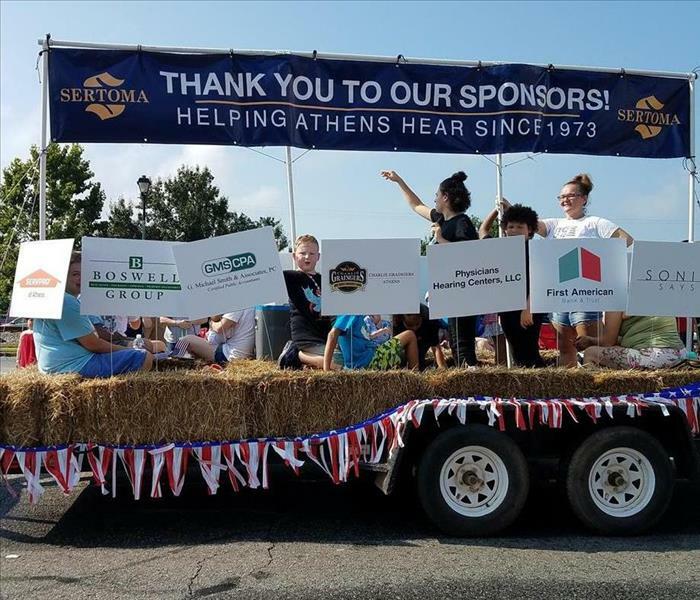 SERVPRO of Athens proudly sponsored Sertoma in the 2018 4th of July Parade. Sertoma's Mission is to improve the quality of life today for those at risk or impacted by hearing loss through education and support. 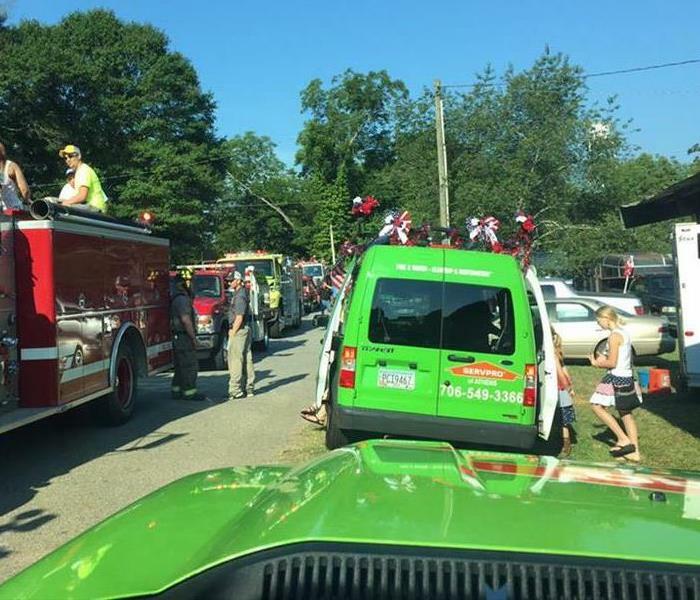 SERVPRO of Athens was at it again at the annual 4th of July Parade in Colbert, GA. Shelley Patterson, Sales Manager, proudly drove the SERVPRO truck as the production crew cleaned up after the parade. Full-face respirators protect our crews from harmful bacteria, smoke odors, and fungal growth. It is important to make sure your respirator is functioning to its highest capability. Pictured is our production manager demonstrating to the SERVPRO of Athens production technicians how to make sure your respirator is fitting properly. Respirator fit testing is essential in the restoration business. This is a photograph of our production crew during their annual fit test. Special thanks to our representative, Neil Gallien, with Abatix. He assisted us this year and made sure that our crew is safe and within compliance. We appreciate him taking the time to come out to SERVPRO of Athens! This closet has high moisture content which is the perfect breeding ground for fungi. Left untreated the fungal growth would spread up the walls creating a huge problem for this homeowner. SERVPRO of Athens assisted with HEPA vacuuming the growth, cleaning the wall, and treating it with an antimicrobial. Due to the high humidity in our state we see a lot of fungal growth on the joists in the crawlspace of your home. Our professionals clean the joists and apply antimicrobial to the affected areas. Fungal growth can be commonly found in the crawlspace thriving on floor joists. SERVPRO of Athens offers mold remediation estimates and services. Pictured is a completed mold remediation on the floor joist of a home. Our teams works together to help you during storm events. 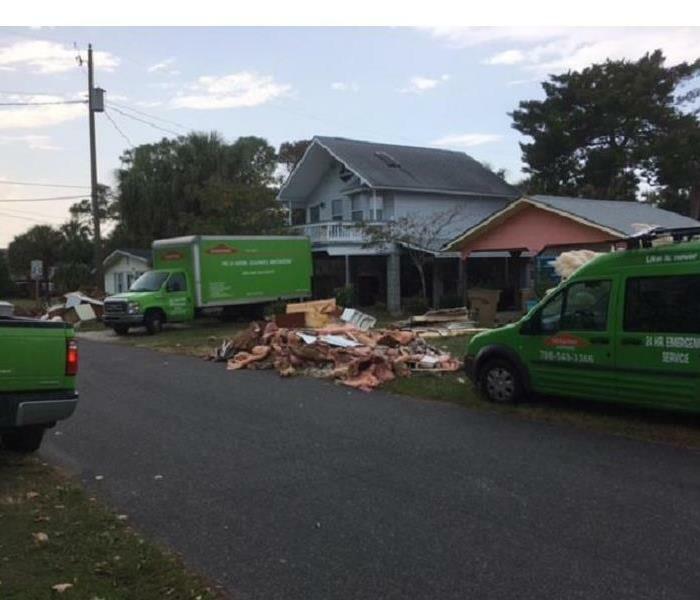 SERVPRO of Athens is part of a storm team that travels to nearby locations to assist with disaster relief. As always awareness and preparedness are important for all Georgians, so know your risk, make an emergency plan and stay aware. 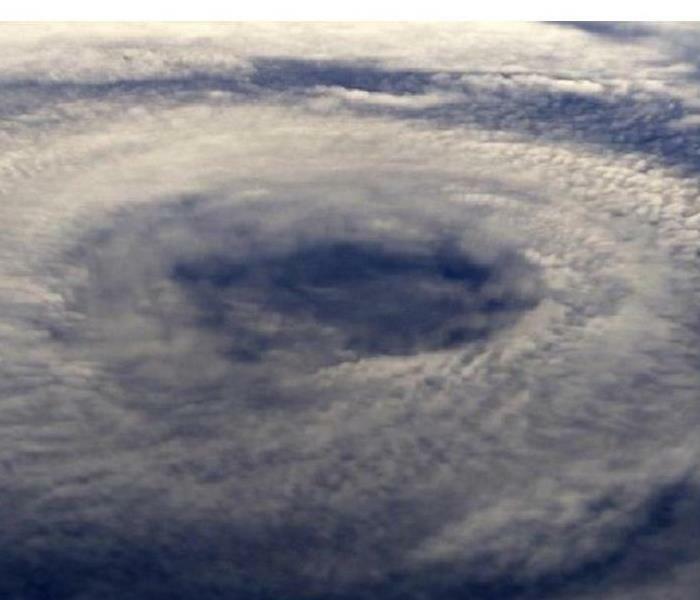 As a coastal state, Georgia is at risk for hurricanes that form in the southern Atlantic Ocean, Caribbean Sea and Gulf of Mexico. Although Athens is not as close to either of these coast lines the catastrophic damage can reach even hundreds of miles inland. Always know what to during a catastrophic event. Fire damage can happen to anyone at anytime. The best course of action is to always be prepared. Be sure to talk with your children and have a plan in case something were to happen. 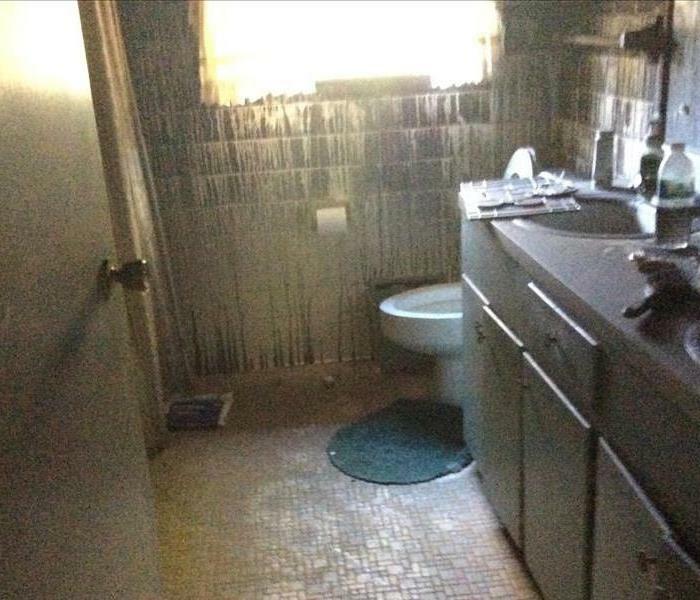 The bathroom pictured was not close to the source of the fire. Smoke travels throughout the home causing damage to many to all of the structure. Stove top fires are dangerous and scary for any homeowner. This family had a safety plan in place. The family evacuated the premises and safely extinguished the fire. SERVPRO of Athens arrived onsite removed the source and began cleaning immediately for the family to return to a clean home. 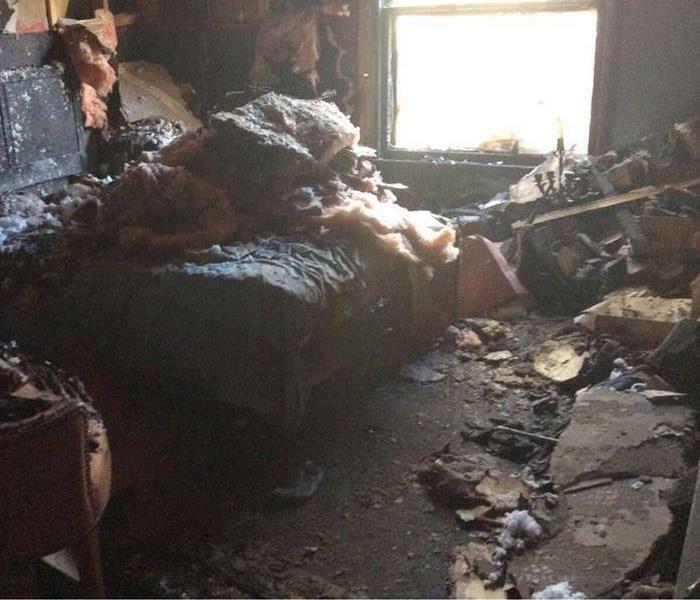 This picture is the aftermath of a fire damage in a local Athens Georgia home. The family was devastated for their home to be in shambles. 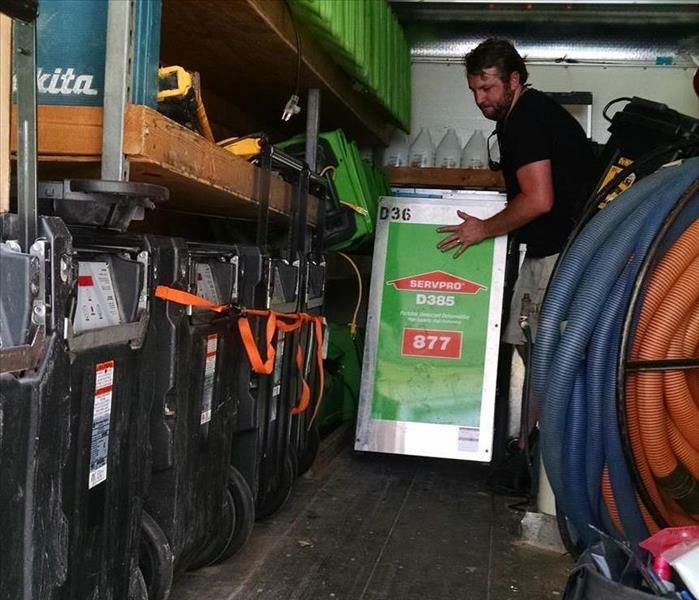 SERVPRO of Athens worked fast to remove all of their belongings to be cleaned and later returned to a rebuilt home. The customer was highly satisfied with the response time and the work ethic of our detail crew. SERVPRO OF ATHENS, Sales Team. This picture was taken during a morning meeting. After the meeting, they rush out the door to visit the community and build lasting relationships. We are proud of our Sales and Marketing Reps! SERVPRO of Athens' owner, Peter Wood, reaches out to educate our community. Peter takes pride in reaching out to our local property managers and tenants and providing them with the necessary tools to mitigate mold and malodor issues. SERVPRO of Athens assists with many types of disasters. Our team has traveled as far as Houston, Texas to aid victims of storms. While traveling we came across the SERVPRO Disaster Recovery Team. Our franchise is a part of this recovery team that consists of various franchises who work together to help those who have been affected by disastrous situations. Every morning David Chance, Production Manager, can be found with his production team. David always makes sure the team is prepared for the day. During each meeting the technicians discuss the stages of drying or cleaning for each customer they are helping. This keeps the team organized. The production technicians value David and his leadership. Our thoughts are with those of you who have been affected by Hurricane Harvey! 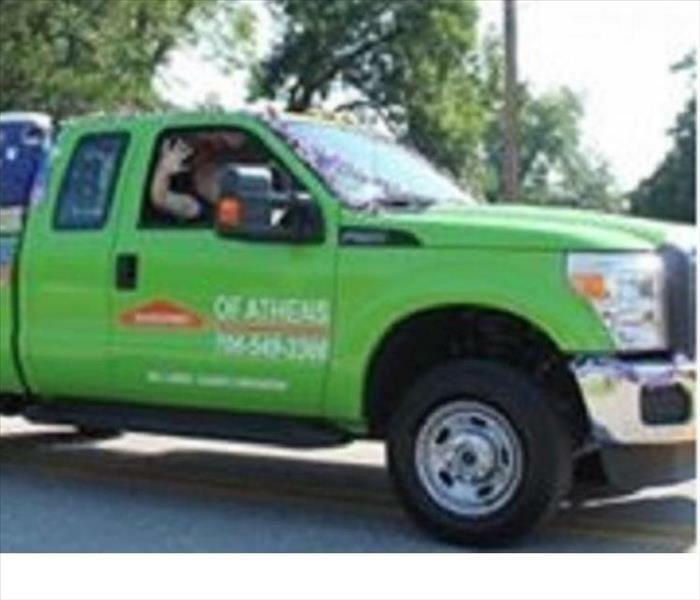 SERVPRO of Athens is on the way to assist those in need. We are part of the Storm Team at SERVPRO. We work with other franchises to respond quickly to the flooding and help get your property back to pre-storm condition. SERVPRO of Athens offers Showcase Carpet Cleaning. This cleaning is for very heavily soiled carpets. We use a roto machine to shampoo and agitate your carpet to loosen the soils. We then use hot water extraction to remove the heavy soils from the carpet. In a sense it is a double cleaning for the price of one! The annual Marigold Parade is held in Winterville, Georgia. Every year you will find our crew walking behind the animals to make it "Like it never even happened.” The production team also brings along water guns to cool down the crowd. Watch yourself out there David Chance is armed and ready! Don’t forget your goody bags because our little cowboy is ready to fill them up! 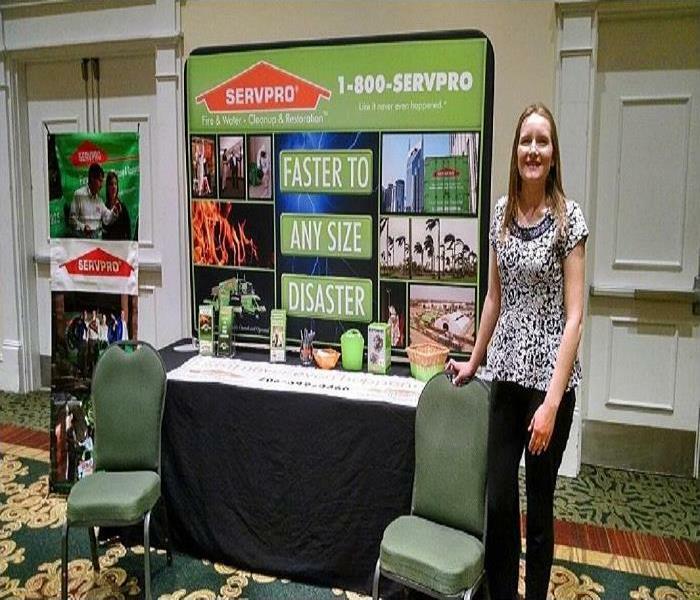 SERVPRO of Athens recently attended a vendor fair for the Athens Apartment Association. Vendor fairs allow us to promote our services to the apartment community. 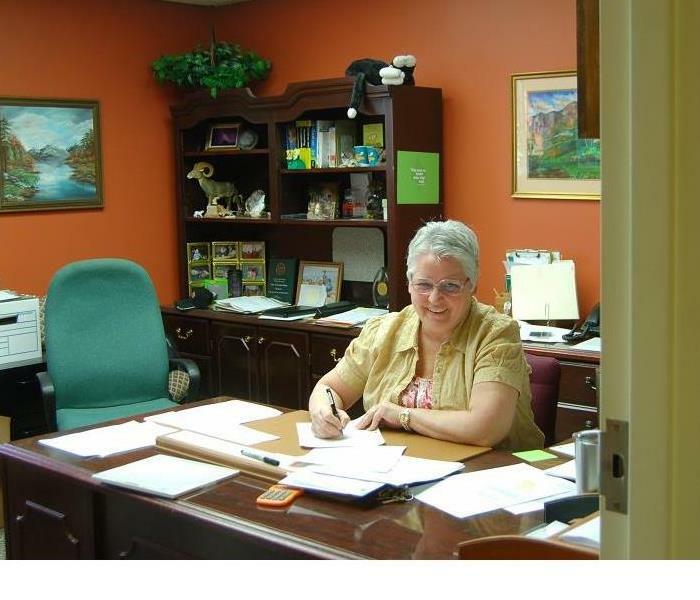 Shelley is SERVPRO of Athens Sales and Marketing Manager. She and David Chance, our Production Manager, work together to reach out to our community. 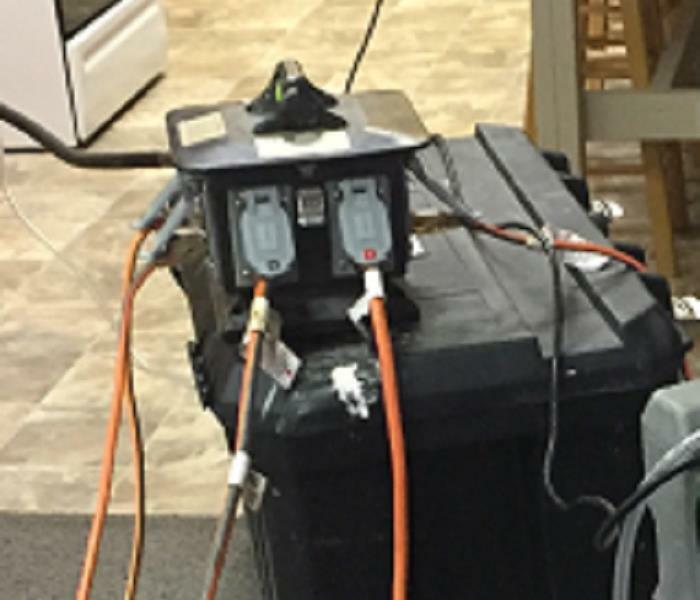 The power distribution box is one of SERVPRO of Athens specialty equipment. It safely breaks down power from a generator or home to usable, common, receptacles. Each receptacle has a circuit breaker to protect cables from damage. The distribution box is designed to fail if wiring is faulty or circuit is overloaded - protecting people and property. Faulty plumbing supply lines can lead to an abundance of water damages. Water damage from a sink averaged more than $7,000 per incident. Of these incidents, 44% were attributed to faulty plumbing supply lines. Be sure to periodically check for water dripping off the lines under sinks or behind toilets to prevent large water losses. SERVPRO of Athens can respond quickly to your restoration emergency. This photo was taken outside of an Athens, Georgia commercial building. Our team responded to the emergency fire and water damage and restored the building to preloss condition. Our technicians work hard to get commercial businesses back in working condition. 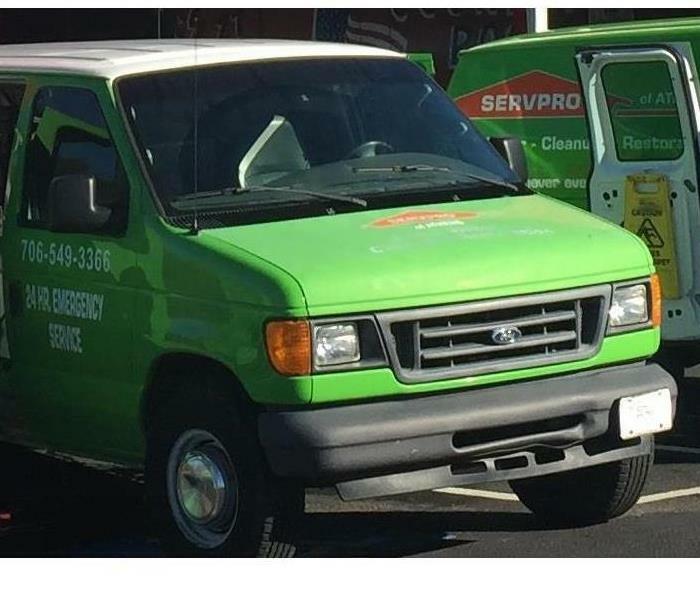 This business called SERVPRO to help with a fire and water damage. The fire caused the sprinkler system to trip. 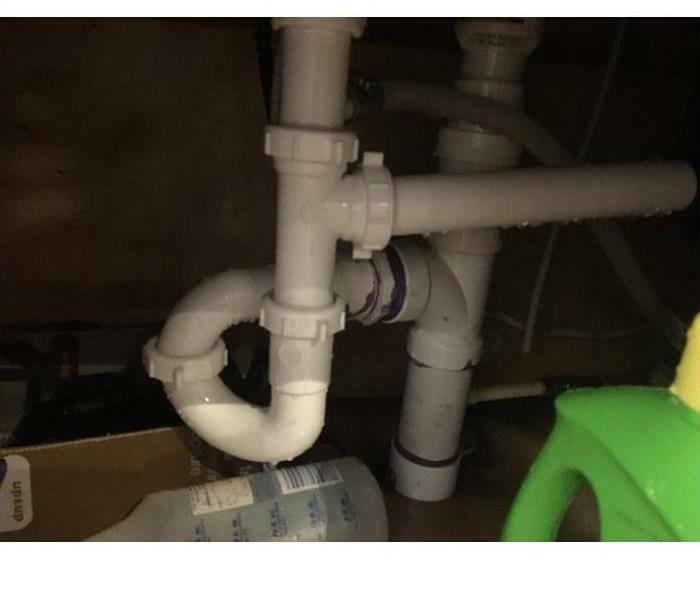 SERVPRO technicians arrived on site to make this disaster "Like it never even happened." 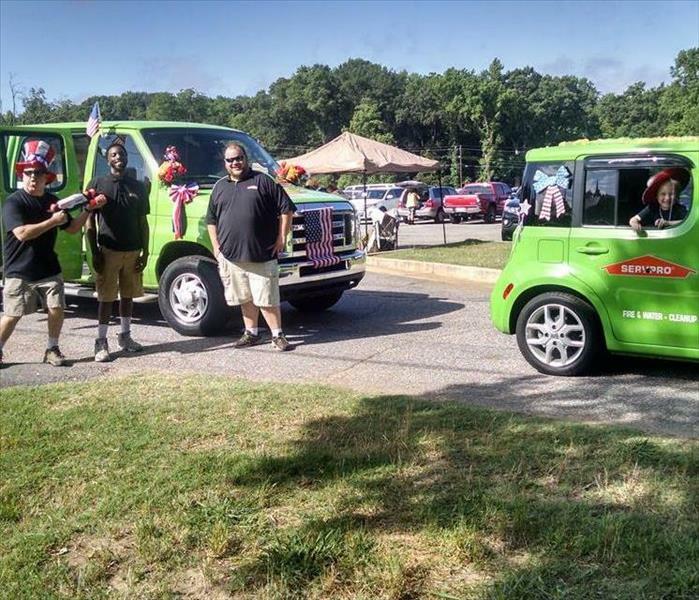 SERVPRO of Athens, Monroe, Madison & Monticello all arrive decked out ready for the 4th of July Parade. Our franchise participates in the yearly parade to enjoy the day with the community members. SERVPRO of Athens, Monroe, Madison & Monticello also pitch to clean up after the parade is finished. This is simply because we all know SERVPRO likes to leave things "like it never happened!" SERVPRO of Athens, Monroe, Madison & Monticello uses a unique floor drying system. Drying mats extract water out of the subfloors by pulling the water to the surface of the wood. The drying system is also quiet and does not use power in excess. These drying mats are another wonderful tool that SERVPRO of Athens, Monroe, Madison, & Monticello can use to save a home from some of the most devastating water damages. Claudia Wood, one of the owners at SERVPRO of Athens. Claudia works hard to make sure all of her employees are up to date on the latest information needed to perform their job. When she is not behind her desk she can be found in the warehouse helping out others. 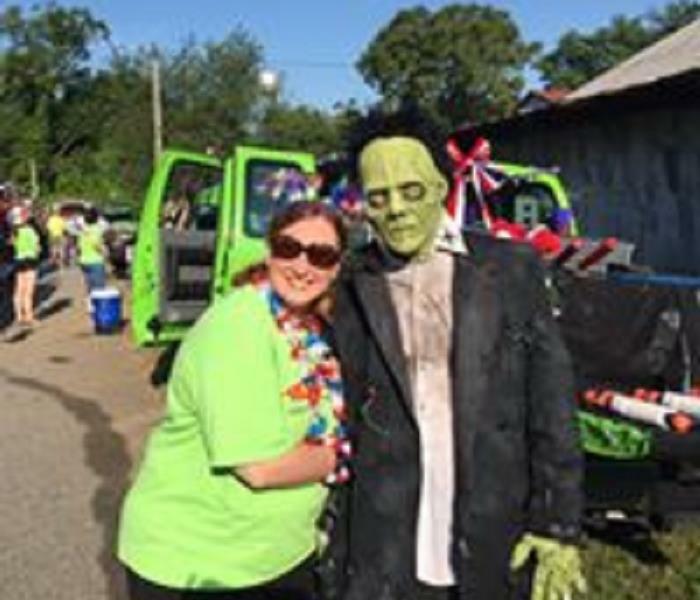 Lisa, the Sales Manager at SERVPRO of Athens was spotted at a carnival with her new friend Frank. I think it was more the color of her shirt that Frank liked. 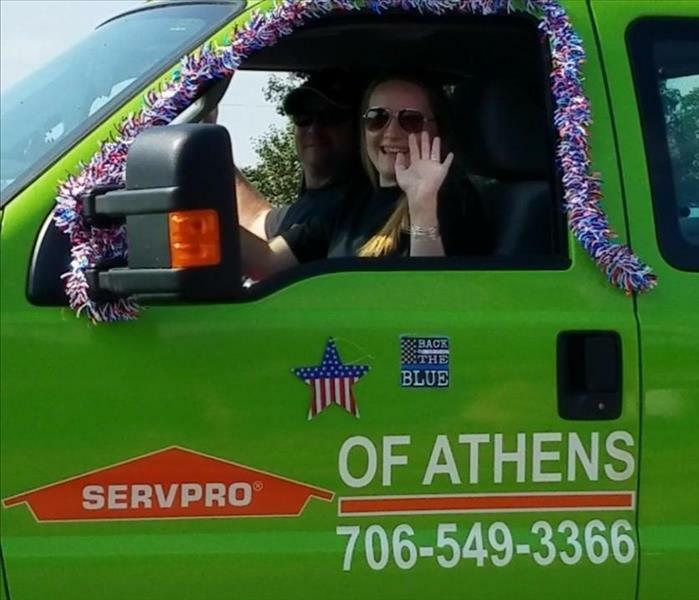 SERVPRO of Athens participated in The City of Colbert’s 4th of July parade. It was a lot of fun for employees and their families. Although for fun, the parade officials placed our float behind the horses. We can only imagine it is because they wanted it to appear “like it never ever happened”!